Mark generously contributed to the campaign as a birthday gift to me. For awhile it looked like they weren't going to meet their goal. Which would have meant the end for the concept, since though Mr. Sousa is a James Beard semi-finalist chef with a loyal following, banks are not interested in investments in such an economically distressed area. But in the eleventh hour, a dramatic surge of support pushed the campaign way over the top and it was fully funded. 124% funded, to be exact. And that right there is what makes this concept revolutionary. Yes, the success of the campaign should be looked at as an example of what can happen when Pittsburgh comes together. It truly is an amazing place to live and even when I'm shaking my fist in my car at the traffic approaching the Fort Pitt Tunnel, I am blessed to live and work here. But this goes beyond Pittsburgh. Fine dining is virtually inaccessible to anyone below a certain economic threshold. And because of that, it's often thought of as elitist. The same holds true for many issues around health and food. People validly argue that only focusing on issues like organic agriculture and GMO labeling obscures the fact that thousands of Americans don't have enough FOOD, let alone healthy food. I am so moved by this concept because it holds at its core the value that good, fresh, quality food belongs to everyone - even communities that have been largely abandoned by society. 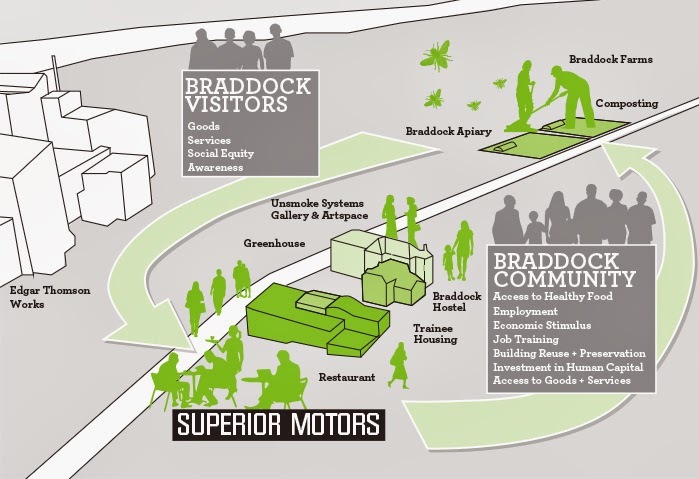 The idea of Superior Motors embodies the word 'community' by feeding, nourishing and sustaining not just the people, but the land and the place and history. It places value there and encourages others to follow. Other communities across the country will look to this project as well, and hopefully attempt to rally around similar investments in their own areas. I am so excited to see Superior Motors develop and can't wait to go eat there someday. It's going to be worth braving the tunnel traffic, that's for sure. GMO culture war - is there a middle ground?